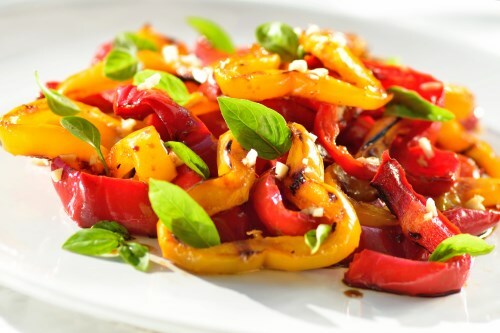 Place the bell peppers onto a baking sheet. Roast in the preheated oven until the skins are nicely blackened, about 30 minutes. Turn the peppers once halfway through to ensure even cooking. Once blackened, place the peppers into a bowl, cover with foil, and allow to steam 20 to 30 minutes. Meanwhile, whisk together melted coconut oil, vinegar, salt, pepper, garlic, and capers in a bowl; set aside. Once the peppers have finished steaming, remove and discard the stems, skins, and seeds. Cut the peppers into quarters and stir into the vinaigrette. Cover with plastic wrap and refrigerate at least 30 minutes before serving.